Hey guys! Welcome to this video tutorial on word problems involving ratios. Ratios are what we use to compare certain number values. People everywhere use ratios. We use, or at least we should, use ratios when we cook. For example, if I were to make macaroni and cheese for a group of 6 people and I knew that a ½ cup of macaroni would feed one person, then I could multiple 6 times ½ half to get 3. Well 3 to 6 is my ratio, and this ratio tells me that for every 3 cups of macaroni that I have I can serve 6 people. But hang on, what if I told you that 1 cup of macaroni to every 2 persons is the same ratio as 3:6? Well, it is the same ratio. 3 to 6 can be reduced to 1:2 because both 3 and 6 are divisible by 3, which is how we get ½. So, even though these two ratios look different, they are actually the same ratio. Let’s take a look at a few word problems, and practice working through them. There are 7 kids in a classroom with green shirts, 8 with red shirts, and 10 with yellow shirts. What is the ratio of people with the red, and yellow shirts? Alright, so let’s look at our problem, and see what it is asking us to find, and write out the information that we have been given. So, there are 7 kids with green shirts; so, let’s write that down. We have green-7. We have 8 kids with red shirts, so that is Red-8, and we have 10 kids with yellow shirts, Yellow-10. Now, the question is asking us to find the ratio of kids with red, and yellow shirts. Which means that we don’t even need to look at our number of green shirts. I’m just going to cross that out for now. We are just looking for the ratio of red shirts to yellow shirts. Well, we have 8 red shirts, and 10 yellow shirts, which gives us a ratio of 8:10. So, now let’s look at each of our options, and eliminate. It can’t be 7:10, we don’t care about the green shirts. It can’t be 8:7, because again we don’t care about the green shirts. Option C is correct, that is the exact number ratio we found. Now, look closely at “d” here. Is 4:5 not the same thing as 8:10. 8 and 10 are both divisible by 2, and when we reduce them both down we get 4:5, so “d” is also correct. Great now let’s look at another word problem. A vegetable tray contains 12 baby carrots, 27 cherry tomatoes, 18 florets of broccoli, and 45 slices of red bell peppers. For every 2 baby carrots there are 3_____. Alright, let’s start off the same way that we did our last problem; read through the problem, write tdown what we know, and find out what is being asked. So, this vegetable tray contains 12 baby carrots, let’s write that down (carrots-12). It contains 27 cherry tomatoes (tomatoes -27). We have 18 broccoli florets (broccoli-18), and 45 slices of red bell peppers (peppers-45). Great, we have all of our information given in the problem, but what are we looking for? It says that for every 2 baby carrots there are 3 somethings. So, we need to find what those somethings are. How do we do that? Well, look at our original number of baby carrots in the problem, it’s 12, but in this ratio it’s been reduced down to 2. What happened to make this number 2? It was divided by 6. So, since we are dealing with a ratio we know that whatever one number in the ratio was reduced by the other number has to be reduced in the same way. So, we can multiply 6 times our 3, and 6 times 3 is 18. When we look at all of our information written down we can see that we have 18 broccoli florets; so there is our answer. For every 2 baby carrots there are 3 broccoli florets. Another way to check and verify that these two ratios are equal is by setting them up in fraction form and cross multiplying. When we cross multiply we get 36=36. You can practice finding ratios anywhere you go, like finding the ratio of boys to girls in your class. 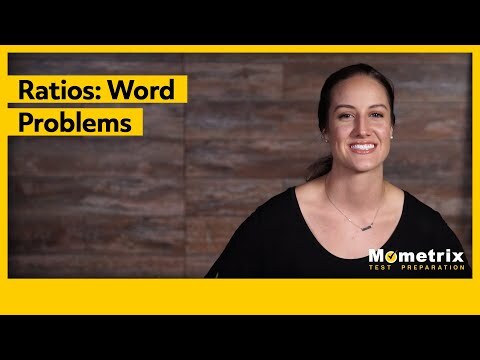 I hope that this video helped you to understand how to solve word problems with ratios. If it was helpful be sure to subscribe to our channel for further help.